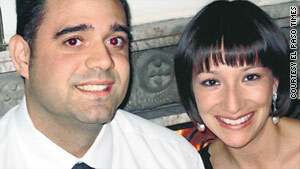 Two of the victims were U.S. Consulate employee Lesley Enriquez and her husband, Arthur Redelfs. (CNN) -- The Mexican military has arrested a suspect in the killings this month of three people with ties to the U.S. Consulate in Ciudad Juarez, Mexico, police and federal spokesmen said Monday. The arrested man is Ricardo Valles de la Rosa, municipal police spokesman Jacinto Seguro said. According to Juarez newspaper El Diario, the suspect also was sought in connection with at least one other homicide: the killing of Zapata Reyes, a member of the rival Mexicles gang. Valles de la Rosa reportedly has U.S. ties, having been charged with 10 counts related to drug trafficking in the United States, local media said. The suspect is a resident of la colonia Partido Romero in Ciudad Juarez, the media said, adding that he may rent a place in El Paso. Federal spokesman Enrique Torres said the suspect was arrested sometime Friday. He did not release a name, but described him as being 42 years old and a member of the Aztecas, a local street gang affiliated with the Juarez drug cartel. "The Chihuahua state attorney general is telling us that this guy is implicated in the killings of Arthur Redelfs and his pregnant wife, Lesley [Enriquez]," Seguro said. El Diario reported that the suspect was captured with the help of the FBI. An FBI spokesman in El Paso, Texas, had no comment, other than to say that the investigation continues. The three victims had all been at a party in Juarez and left in two vehicles that looked similar. They were killed on the roads in drive-by shootings. Enriquez was an employee of the consulate in Juarez and was four months pregnant. Redelfs, her U.S. citizen husband, was a jailer in El Paso. The couple's 10-month-old child, who also was in the vehicle, was not injured. The third victim, found dead in the other vehicle, was identified as the husband of a Mexican employee of the consulate. His wife was not traveling with him, but two of their children in the car were wounded, officials said. Opinion: Mexican border an imaginary line?